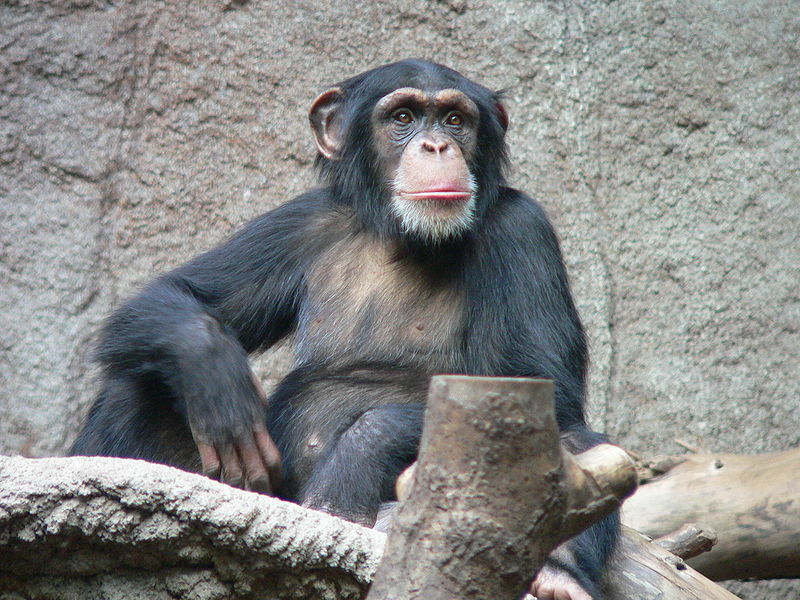 Common chimpanzee in the Leipzig Zoo. Image credit: Thomas Lersch, via Wikipedia. Teamwork has been fundamental in humanity's greatest achievements but scientists have found that working together has its evolutionary roots in our nearest primate relatives – chimpanzees. A series of trials by scientists found that chimpanzees not only coordinate actions with each other but also understand the need to help a partner perform their role to achieve a common goal. Pairs of chimpanzees were given tools to get grapes out of a box. They had to work together with a tool each to get the food out. Scientists found that the chimpanzees would solve the problem together, even swapping tools, to pull the food out. The study, published in Biology Letters, by scientists from Warwick Business School, UK, and the Max Planck Institute for Evolutionary Anthropology in Leipzig, Germany, sought to find out if there were any evolutionary roots to humans' ability to cooperate and coordinate actions. Dr Alicia Melis, Assistant Professor of Behavioural Science at Warwick Business School, said: "We want to find out where humans' ability to cooperate and work together has come from and whether it is unique to us. "Many animal species cooperate to achieve mutually beneficial goals like defending their territories or hunting prey. However, the level of intentional coordination underlying these group actions is often unclear, and success could be due to independent but simultaneous actions towards the same goal. "This study provides the first evidence that one of our closest primate relatives, the chimpanzees, not only intentionally coordinate actions with each other but that they even understand the necessity to help a partner performing her role in order to achieve the common goal. "These are skills shared by both chimpanzees and humans, so such skills may have been present in their common ancestor before humans evolved their own complex forms of collaboration"
The study, revealed in a paper entitled Chimpanzees' (Pan troglodytes) strategic helping in a collaborative task, looked at 12 chimpanzees at Sweetwaters Chimpanzee Sanctuary in Kenya, which provides lifelong refuge to orphaned chimpanzees, who have been illegally traded as pets or saved from the 'bushmeat' trade. The chimpanzees were put into pairs, with one needed at the back and one at the front of a sealed plastic box. Through a hole the chimpanzee at the back had to push the grapes onto a platform using a rake. The chimpanzee at the front then had to use a thick stick and push it through a hole to tilt the platform so the grapes would fall to the floor and both could pick them up to eat. One chimpanzee was handed both tools and they had to decide which tool to pass to the partner. Ten out of 12 individuals solved the task figuring out that they had to give one of the tools to their partner and in 73 per cent of the trials the chimpanzees chose the correct tool. Dr Melis said: "There were great individual differences regarding how quickly they started transferring tools to their partner. However, after transferring a tool once, they subsequently transferred tools in 97 per cent of the trials and successfully worked together to get the grapes in 86 per cent of the trials. "This study provides the first evidence that chimpanzees can pay attention to the partner's actions in a collaborative task, and shows they know their partner not only has to be there but perform a specific role if they are to succeed. It shows they can work strategically together just like humans do, working out that they not only need to work together but what roles each chimpanzee has to do in order to succeed. "Although chimpanzees are generally very competitive when trying to gain access to food and would rather work alone and monopolize all the food rewards, this study shows that they are willing and able to strategically support the partner performing their role when their own success is dependent on the partner's."